How do you run a four-hundred-ton colossus and its crew? It requires speed, decisiveness, foresight, and diplomacy. 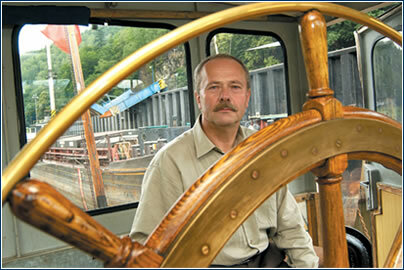 Riverboat captain Vojtěch Kýnl (54), who has spent half his life on rivers, definitely knows how. You’re the captain of the excursion boat Helvetia on the Rhine. 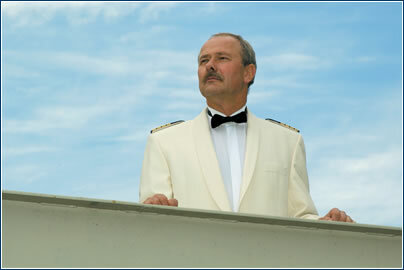 How is it that a Czech captain finds himself on a Swiss ship? Partly because, unlike in the Czech Republic, there’s a need in western Europe for people of my profession. Additionally, western Europe offers better conditions, and not just money. Since I lived up to my employer’s expectations, I was accepted as second captain of the excursion boat Helvetia, in fact a floating hotel accommodating 142 people. Can you describe the hierarchy on an excursion boat? There’s the nautical part and the hotel part. The captain holds the highest rank, and is responsible for everything relating to the ship, but he cannot interfere with the hotel’s chef or housekeeping. On the other hand, when emergency measures are in place and the captain tells the chef to take an oar and row, his word goes (laughs). The engineering crew answers to the first engineering officer, yet they’re all under the captain. How important is it for the crew to be close-knit? It’s essential. A ship is a classic example of teamwork. True, the captain steers the ship and gives orders, but an experienced crew knows what’s expected of it. An independent, close-knit crew is a blessing for every ship. There’s nothing worse than having a ship full of novices, because successful maneuvering depends on each individual. For example, when sailing into locks you need able seamen who can react to any movement of the ship. Clearly, various types of people work side by side, even some who may not get along, but relatively strong discipline is the rule. If they can’t adhere to it, they must leave. I haven’t time to teach anyone. What recourse is there for disobedience? Keel-hauling! (laughs). Of course that’s a legend from the past. You might be surprised, but breaches of discipline are very rare. When it does happen it’s usually because of alcoholism, which the person must overcome or leave the ship. Then there are various specifics; for example, I had a Czech who just looked for ways to hide out. He also had professional shortcomings, but he tried to tell us how to do things. We very quickly parted ways. Excursion boats have international crews, with various mentalities and work habits. Does this require special methods of management? We have Hungarians, Slovaks, Germans, a Bulgarian, a Pole, a Frenchman, a Dutchman, and I’m a Czech. There’s no language barrier, since the common tongue is German, but mentality plays a certain role. Nationalities have their own specifics I have to take into account and adapt not only my command, but also my expectations of what I can get from one group or another. 2004 works as second captain on the excursion boat Helvetia on the Basel-Prague-Basel-Amsterdam route. What sorts of crisis situations can arise on a riverboat, and how do you deal with them? Breakdowns are the classic example. They aren’t as easy to resolve as they are on land. You can’t stop the ship. Once the electrical panel in the engineering room burned. So the air conditioning and kitchen power went out, there wasn’t any running water. We had to improvise so that our guests’ comfort was compromised as little as possible – a team created a brigade to carry water for flushing toilets, the hotel manager arranged a show with a wine tasting. We kept the guests busy until two in the morning, thereby dealing with the situation. Do you solve problems calmly, or emotionally? I try to approach problems calmly. On the other hand, you have to be emphatic and issue unambiguous orders. When maneuvering into locks, seconds count. Steering the ship requires foresight and doing things ahead of time – it does everything rather slowly, but inevitably. There’s no room for discussion, and if the captain yells “Do it now!”, the guy has to do it, because if he doesn’t you can only hang on and hope nothing serious happens. What sort of person wants to work on a ship? What do “boatmen” have in common? They’re people who can’t stand routine work in closed spaces. Although the work rhythm on a ship is regular, the environment in which the ship’s moving is always changing. The pay is also motivating, as we get bonuses for being away from our families. Additionally, room and board are free. How do you build your authority? I don’t think about it much; the captain speaks, and that’s it! But when you’re underway crisis situations arise, and depending on how you handle them your subordinates evaluate you and subsequently respect you. What should an ideal boss be like? Certainly an expert, but to a certain degree he should understand human weaknesses. If you forget to be human, people become machines with the characteristics of machines. This shows up in communication. What do you most enjoy about being a captain? Besides always learning something new on different ships, it’s meeting interesting people. What’s the hardest thing about your profession? Minimal contact with family and friends. I don’t see them for six months at a time.